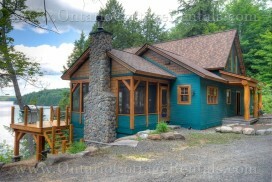 Talk about the ultimate cottage getaway! Located on Fairy Lake just minutes from Huntsville is Logger's Lookout. 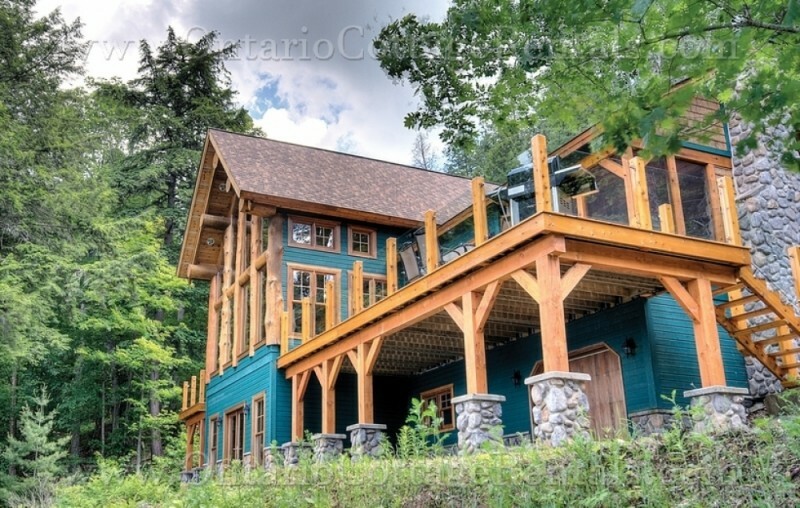 Perched amongst the tall Muskoka trees, this breathtaking property resembles an almost tree fort like surrounding complete with grand rooms, a large number of bedrooms and a one of a kind panoramic view. 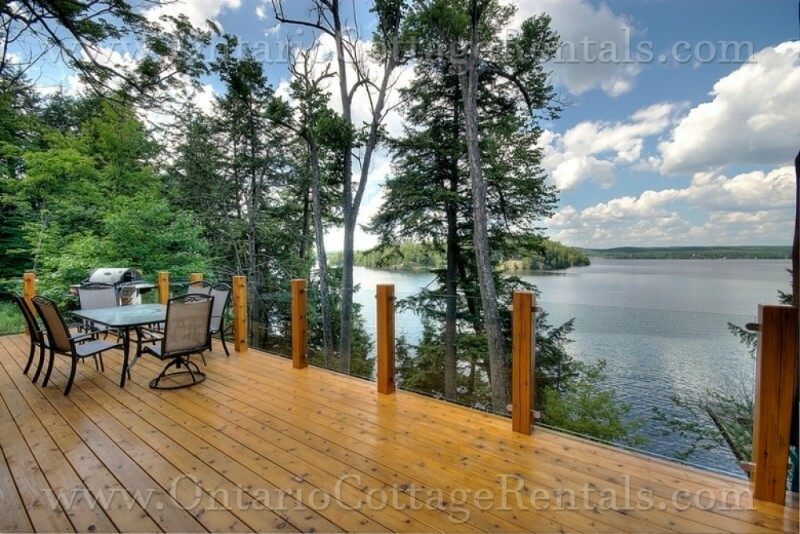 Logger's Lookout is a six-bedroom, two-bathroom masterpiece located on a 20-acre property with a 1,360-foot stretch of waterfront. 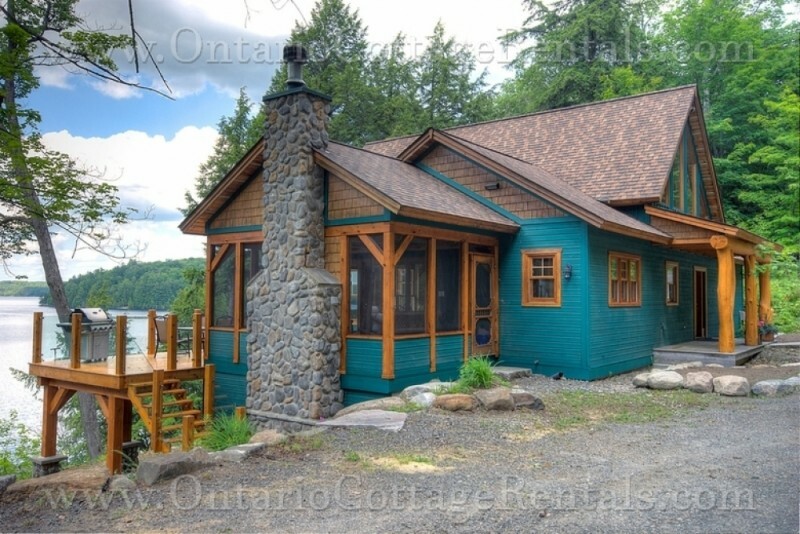 With traditional timber framing and large stone fireplaces located in both the main living space and Muskoka room, vacationers will not want to part with this hidden gem. Entering through the cottage front door, guests first experience the open spaced grand appeal of this wood structured masterpiece. The first bedroom located near the entrance contains a queen bed; around the corner is a full four-piece bathroom as well as the master bedroom with another queen bed. 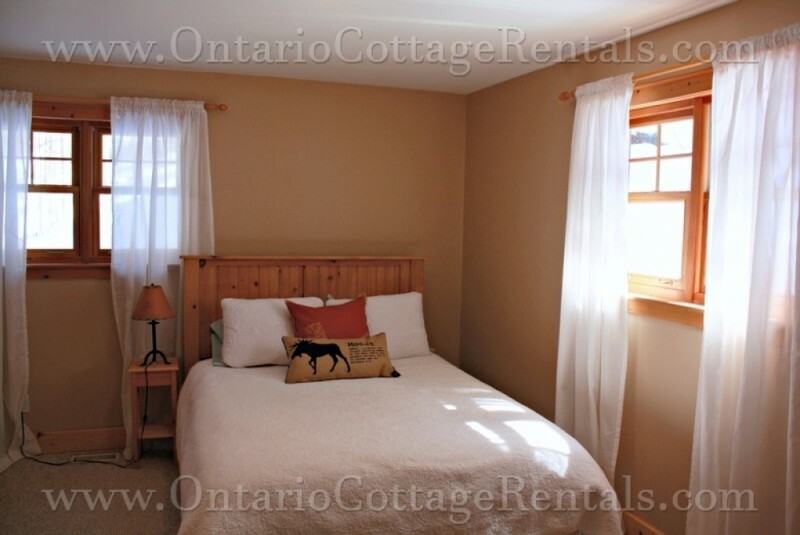 This bedroom boasts a beautiful view of Fairy Lake with a walkout balcony where sunlit mornings are best enjoyed. 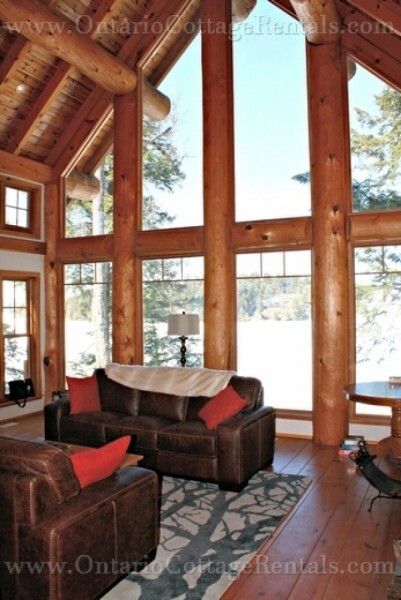 The centerpiece of Logger's Lookout is the living room equipped with floor-to-ceiling windows allowing natural light to bounce throughout. 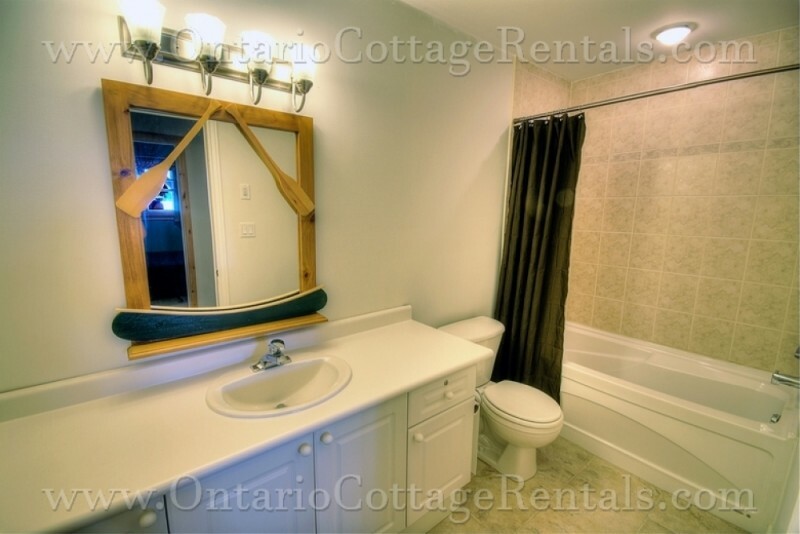 This space offers the best view in the cottage which towers over all other cottages in the bay gives vacationers the chance to enjoy and take in the cottages natural surroundings. 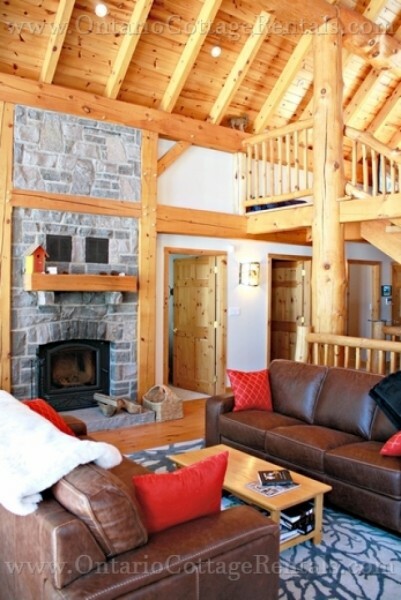 This room contains two large couches for lounging by the large stone fireplace and enjoying family time. Above the main living space is a loft bedroom where a double bed and a double fold down futon are located, this space is especially fun for children. It contains a large flat screen television and a view down to the happenings below. 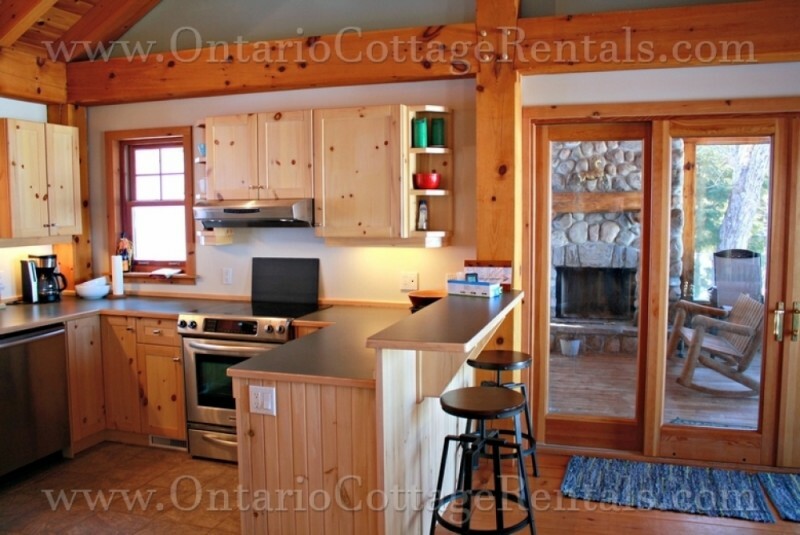 On the other end of the cottage and open to the living room is the kitchen and dining area. The dining table seats six comfortably and guests can take advantage of the kitchen's two bar stools for extra seating. The kitchen is equipped with all new stainless steel appliances; a fridge, stove, microwave, dishwasher and all materials needed for the preparation, cooking and presentation of that much anticipated evening meal with the family. The kitchen and dining room open up to a large deck where the barbecue and six-person patio set is located. 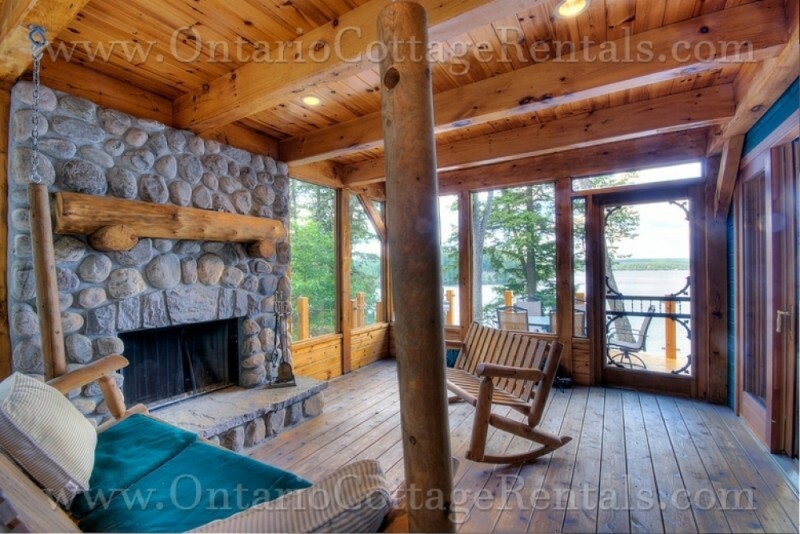 Much like the living room, this is an extension of the panoramic lookout the cottage provides. The dining room's sliding doors open up to the screened in Muskoka room featuring another large stone fireplace and seating for long evenings spent revisiting memories of the day's past. This area is the perfect, bug free family spot and offers yet another breathtaking view of the lake below. 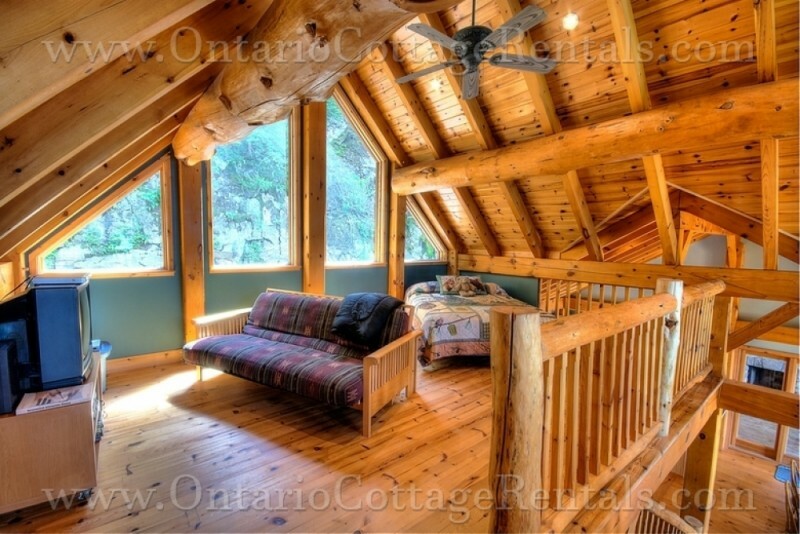 Logger's Lookout also contains a walkout lower level to the waterfront below, where the final three bedrooms can be found. Two of the lower level bedrooms contains queen sized beds and the third bedroom on this level has a bunk bed with a double on the bottom and single on top. 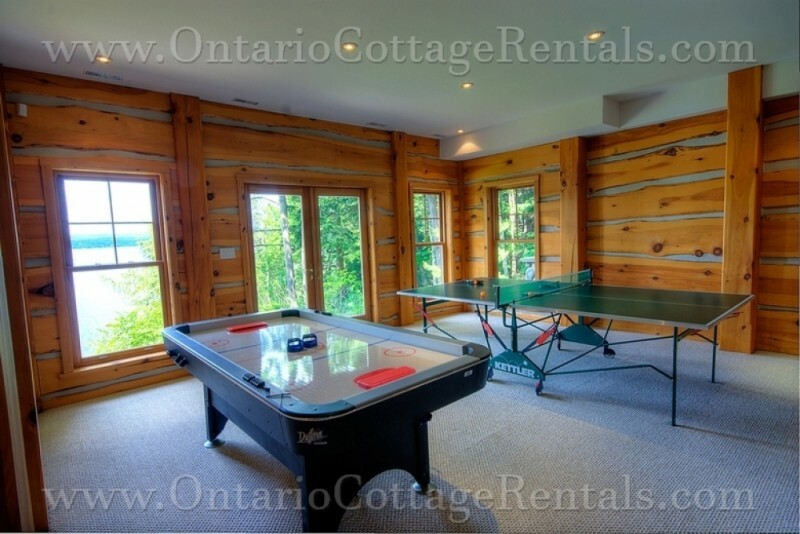 Separating the bedrooms is where all the fun happens: the recreation room features an air hockey and ping pong table with two couches for spectators as well as another large flat screen television. A short walk down to the waterfront leads to an ideal swimming and activity area. 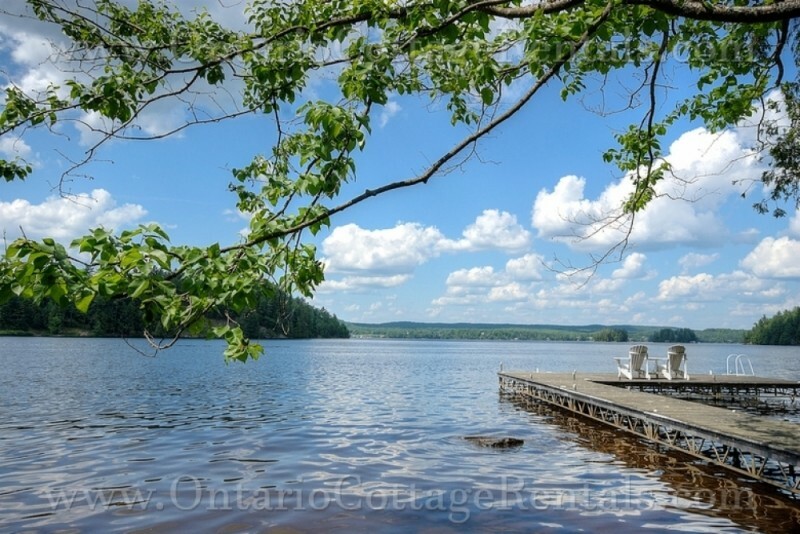 The 30x20 foot dock provides guests with access to five-foot depth at the end where it gradually gets deeper. To the side of the dock is a place where children can safely wade into the water which has a gradual shallow entry point. When the water is low a small sandy beach is featured. 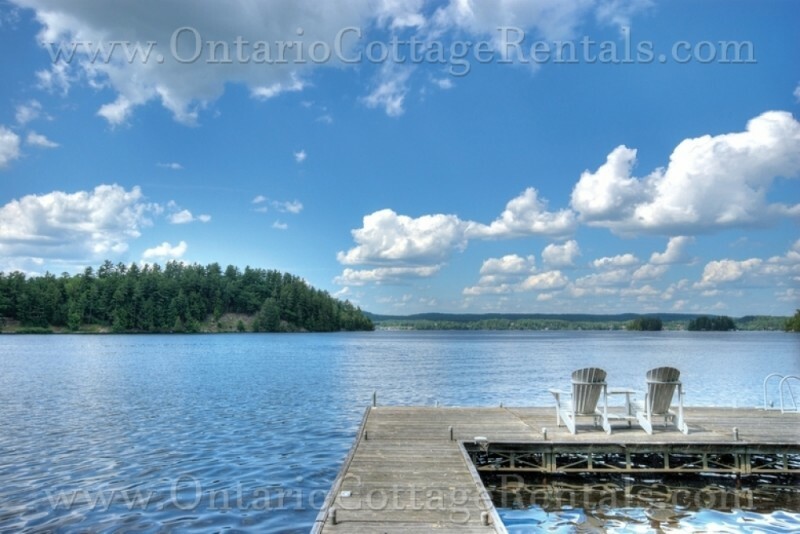 Provided with the rental of Logger's Lookout is the use of two stand-up paddle boards, two kayaks and a canoe for fun waterfront activities. 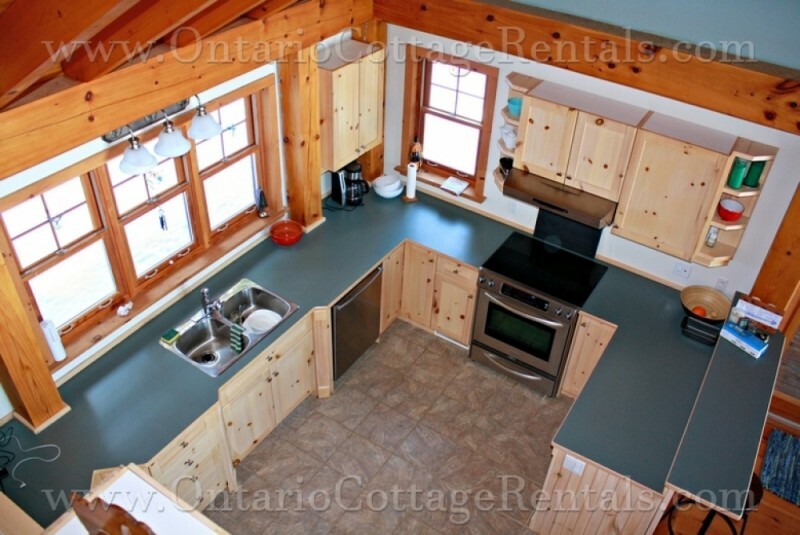 Logger's Lookout provides the family with an ideal getaway that will make you wanting to come back every summer for that much anticipated annual vacation! 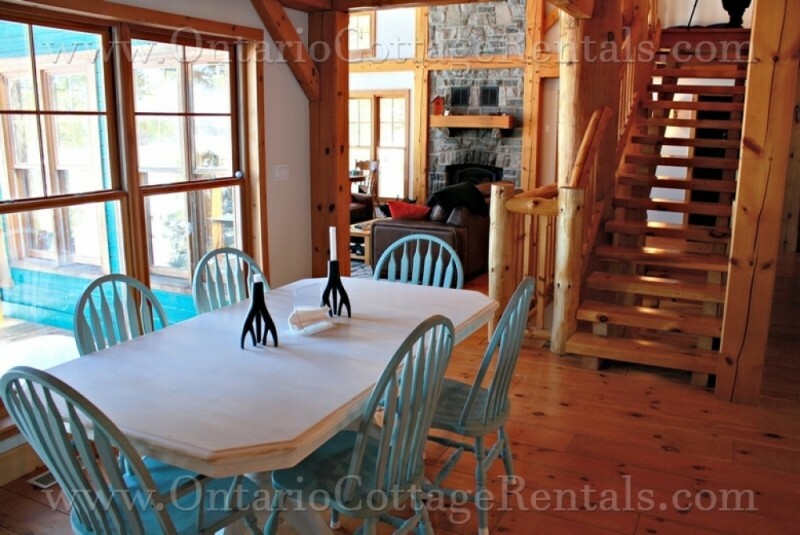 $2,170 per Holiday Weekend in Off Season - 3 Night Stay. 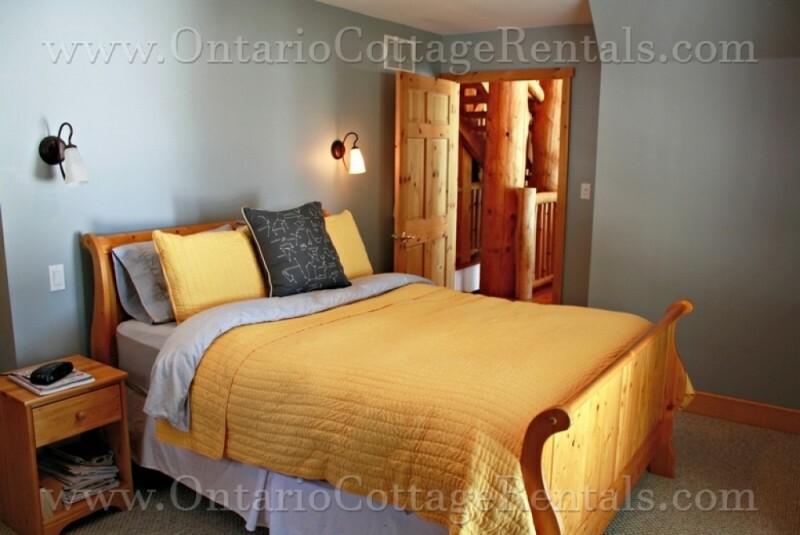 $1,425 per Regular Weekend in Off Season - 3 Night Stay. $1,000 refundable security deposit required. High-Season includes the last full week of June to Labour Day Monday, as well as the week of Christmas and New Year's.